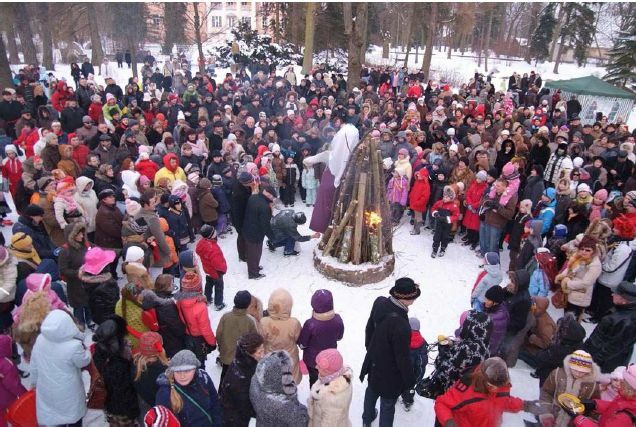 Užgavėnės (Polish – Zapusty,Belarusian – Масленіца) is a festival, which takes place in Lithuania during the seventh week before Easter (Ash Wednesday). Its name in English means “the time before Lent”. The celebration corresponds to holiday traditions in other parts of the world, such as Mardi Gras, Shrove Tuesday, and Carnaval. Užgavėnės begins on the night before Ash Wednesday, when an effigy of winter (usually named Morė) is burnt. A major element of the holiday, meant to symbolize the defeat of winter in the Northern Hemisphere, is a staged battle between Lašininis (“porky”) personifying winter and Kanapinis (“hempen man”) personifying spring. Devils, witches, goats, the grim reaper, gypsies, and other joyful and frightening characters appear in costumes during the celebrations. The participants and masqueraders dance and eat the traditional dish of the holiday – pancakes with a variety of toppings, since round pancakes are a symbol of the returning sun. In Lithuania’s capital Vilnius, the celebration takes place on Gediminas Avenue, as well as at many youth organizations. The festival is a major event at Rumšiškės park.